Welcome to the Middle Creek Elementary School PTA! Thank you for visiting. We are a group of parents, teachers, and volunteers who strive to support our students, teachers, staff, and community by offering enriching programs and events, and through financial support and fundraising. Our goal is to offer activities that enhance to school experience for the K-5 students in our year-round school. 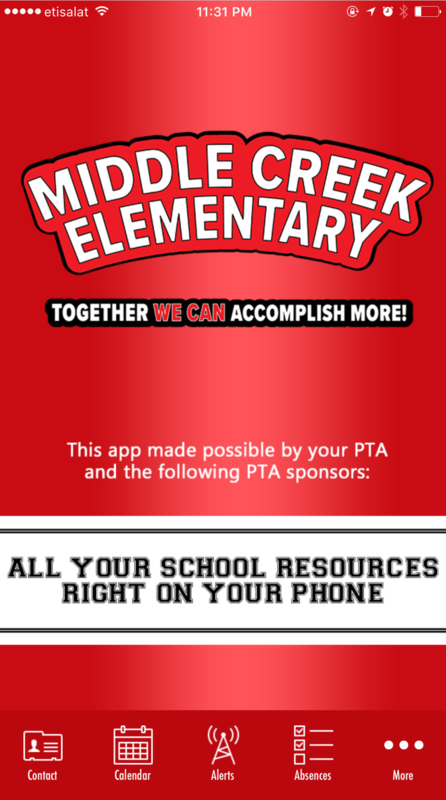 We will communicate important PTA and school information in various ways, but mainly through our school app, our newsletter - News Around the Creek, and our Facebook page. We look forward to seeing you at MCES, and, as always, please reach out here with questions, concerns, or suggestions. We have a custom mobile app at our school! It's never been easier to access event calendars, class information, lunch menus, bell schedules, district information, fundraisers, volunteer opportunities, and so much more! AND, by installing our app, you will receive important announcements and friendly reminders about what’s happening at our school. Search for our school or use these links to download our app today. You'll have a handy icon on your phone and with just a tap or two, you can be connected to our school! Don't forget to accept push notifications so that you receive our text alerts! Please know that his will be the BEST way to receive up to date information from MCES. We encourage all to download and use the app. ​Thank you to our Corporate Sponsors!